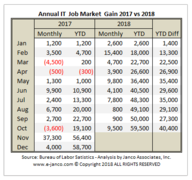 (PRLEAP.COM) Park City – UT– www.e-janco.com – The IT job market is the best it has been in some time with 59,500 new IT jobs created in the January through October period according to Janco Associates Inc. 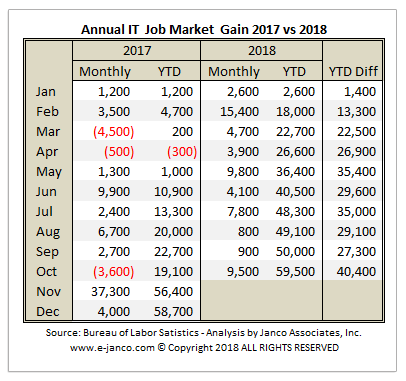 IT Job Market Growth The CEO of Janco Associates, Inc., Mr. M. Victor Janulaitis said, "The current economic recovery continues to create demand for IT Professionals. Even with the turmoil caused by the "trade wars", political unrest, and slow growth outside of the U.S., CIOs are looking to increase the size and skill sets of their IT staff's." He added, "CIO are creating new jobs that address the increased focus on Internet based operations and automation. It now not unusual to see positions like SEO Specialists and IT – Robotics Analysts added to the mix of IT professionals that are being recruited. In our IT and Internet Position Descriptions HandiGuide, which will be released in January, several new positions have been added for those new digital marketing and automation-based jobs." Janulaitis noted, "IT Pros are much more mobile as they have the luxury of a great job market. This has increased the attrition rates within the IT function. CIOs are now dealing with staff retention issues for the first time in several years. To combat this, many organizations have budgeted across the board increases in compensation for 2019 and are increasing current compensation for key IT Pros immediately as way to minimize potential loss of key staff. " The CEO said, "From an infrastructure point of view, job descriptions which clearly define necessary skills and the roles/responsibilities need to be updated as the expansion of IT processes. To help address this, Janco has updated its IT Job Descriptions to address not only the technological components, but also the roles and responsibilities to meet the latest digital marketing and mandated compliance requirements. In January, we will release a major update to most of our products to reflect these changes." 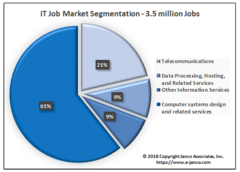 Analysis of IT Job Market growth shows that in 2018 there has already been an addition of 59,500 new jobs. That is 40,400 more new jobs than were created in the same period of 2017. Janco conducted several spot interviews with two dozen CIOs in the last week of October. All of those interviewed said they were actively recruiting for IT professionals for new development activities and replacements for those who have left in the last few months. Attrition rates are the highest they have been in the last several years. Janco also found that several organizations have slowed the hiring process as they work to absorb the new hires. The CEO of Janco added, "IT and HR recruiting managers are now more optimistic. They are focusing on additions to the IT staff as they finish 2018. However, the recent stock market correction and the increase in the interest rates has caused some to slow and or pause expansion efforts." Janco's CEO said, "CIOs are optimistic that the economy will be one that will foster growth. Most already have approved 2019 budgets and in some cases even increased spending budgets after the initial budgets had been approved. A definite bullish sign."